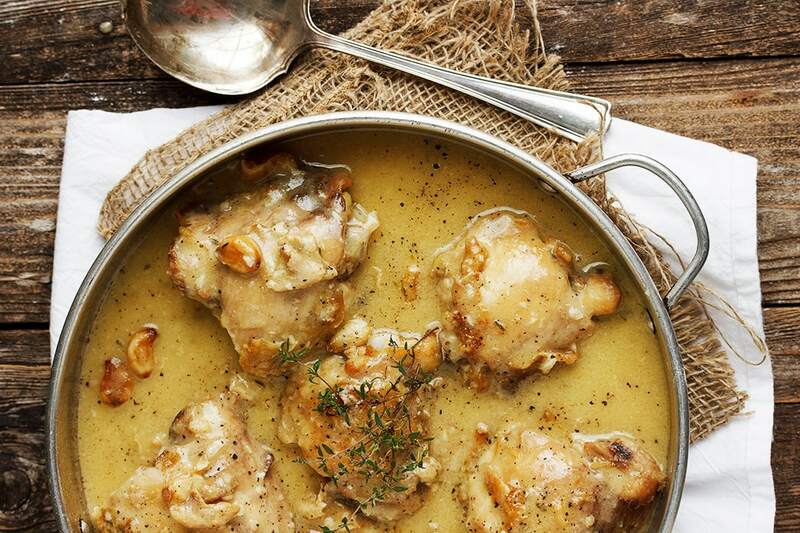 In the mood for chicken with gravy? 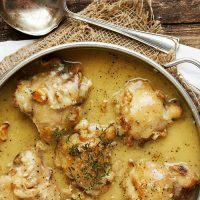 This delicious, one-pan, Rustic Chicken with Garlic Gravy fits the bill perfectly and is a garlic lover’s dream dinner! You’ll want to bust out the mashed potatoes to soak up every bit of this fabulous gravy! 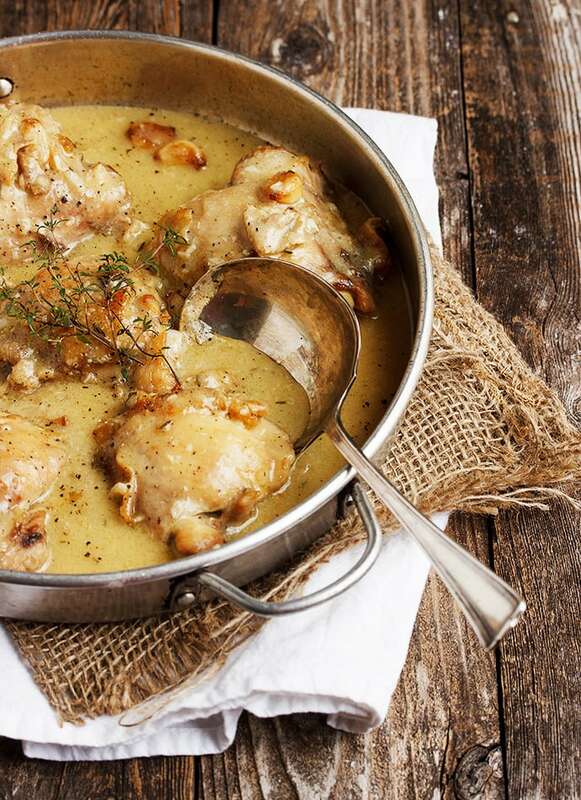 This one-pan, chicken with gravy dinner is so delicious, you’re sure to make it a regular in your household! 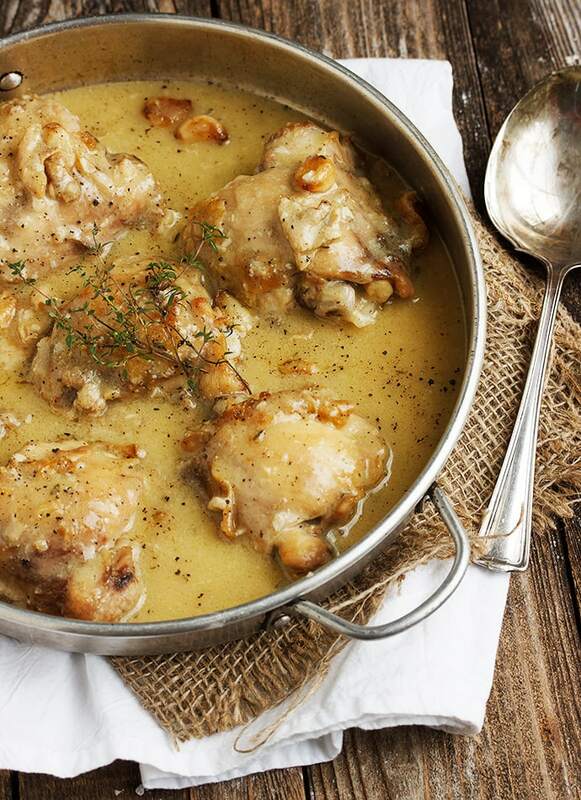 The chicken is moist and browned and the gravy is rich and full of garlic. Twenty cloves worth! But you’d never know it, because the garlic too gets browned and softened and changes into sweet bits of flavour, much like the beautiful mellow flavour of roasted garlic. If you’re like me, the thought of separating and peeling the 20 cloves of garlic for this recipe isn’t super appealing. I picked up a bag of the pre-separated and peeled cloves at the grocery store for about $1. Money well spent, if you ask me :) And again, don’t worry that you won’t be able to leave the house for days after eating this. Like roasted garlic, this garlic becomes very mellow. You’ll know it’s there, but it won’t knock you (or anyone else) over. As for the chicken, any cut will do. I used thighs here and I like skin-on for a more moist chicken, but skinless will work. Sadly, the skin on my thighs stuck a lot when I was cooking them this time. I think I rushed it and my oil wasn’t as hot as it should be, so I guess that’s a tip to make sure your oil is almost smoking hot before adding your skin-on chicken to it. It will look prettier if the skin actually stays on the chicken, but even if it doesn’t, the skin still cooks in with the dish, so the flavour and crispy bits are still there. I scooped them out with the chicken pieces, so they didn’t burn when the garlic was cooking. You’ll want serve this with something on the side to make the most of the delicious garlic gravy. My choice is usually a creamy mashed potato, but pasta or rice would also be nice. At the risk of carb over-load, I’d even through a great crusty bread in to the mix, to dip in the gravy. Add a salad or veg for a complete meal. I love green beans or broccoli with this dish. Remove the pot from the oven and put it on a burner. Be careful not to touch the hot pot! Remove the chicken pieces from the pot to a clean plate. Over medium-high heat, whisk in the wine and simmer for 1 minute. Whisk in the broth, thyme and a bit more salt and pepper, then reduce heat and simmer, stirring regularly, until sauce thickens. Turn the heat off and stir in the butter. Taste sauce and add more salt and pepper, if it needs it. Add the chicken back to the pot to re-warm with the sauce. Serve spooned over mashed potatoes, rice or pasta. 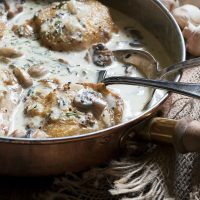 Delicious chicken thighs with a creamy mushroom and tarragon sauce. Bring a little Korean spice to your chicken thighs. Served with a delicious crispy rice. Classic, easy and delicious, this is a family-pleasing meal for anytime. I’ve been dying to try this. The photo looks so good I wanted to lick the computer screen the first time I saw it, and I adore garlic, but I was wary of the recipe because baking the browned chicken and garlic with flour in a casserole with no liquid at a high heat had me a little worried. I know the flour will ‘cook off’ in the oven before thickening the sauce, but I was concerned that everything might catch/burn due to the dry cooking. My curiosity has got the better of me so I’m going to have faith and make it on Saturday. I think I’ll bone out the chicken thighs and add a spring or two of thyme. Can’t wait! I think you will love this dish, Chris and don’t worry about the chicken. While it is high heat and no liquid, the dish is covered and baked for just a short time, so it will retain it’s moisture nicely. Enjoy!! I made this a few times now and I must say the sauce is simply divine, I can’t get enough of it. Thank you for sharing! It looks and sounds so yummy,I can’t wait to make it! Here’s an easy way to peel the garlic that your kids will love to do for you: put the garlic bulb in a med. sized stainless bowl and invert another one the same size over it so it looks like a small ball. Hold the two bowls together and shake, rattle, and roll. All the shells will come off and you will have clean garlic cloves all separated. It might work if you use an empty peanut butter jar with the lid screwed on. You would be able to watch the process. This was the most delicious dish ever! My husband couldn’t stop talking about it. He beat me to the leftovers and he never eats left overs! I’m doubling the recipe next time. Thank you Jennifer! butter on this recipe ? All I can say is ditto to the above. Made this tonight, and while I don’t usually post, this was a keeper. Thank you for the great sauce. This was delicious! Great recipe thank you! Oh! I can’t wait to hear how it turns out :) Let me know! Oh my goodness. Now I can’t wait until 4:00 to start dinner. Sounds so good. This is such a silly question, but I’m new at cooking……I never understand when recipes call for a head (or more of garlic). It’s a bulb that comes apart, I know, but am I supposed to just put all the pieces of the bulb in the pan to cook and then we’ll just eat those bulb pieces? Hi Melissa and there’s no such thing as a silly question (we were all new cooks once! :) Usually recipe writers talk about heads of garlic, rather than specifying an exact number of cloves simply because each bulb of garlic has a different amount of cloves inside. Some have lots of little ones, while others have fewer large ones. It really doesn’t matter for the sake of the recipe so much, as the same amount (roughly) of garlic is going in the pan. Unless you are roasting a whole garlic head (to produce roasted garlic paste), most recipes mean that you would separate all the individual cloves of garlic that are in that bulb, peel each of them and then cook them as individual whole cloves (as is the case with this recipe, but other recipes may specify chopping or minding the cloves). You would discard all the peel and outer part. For roasting garlic, sometimes recipes ask that you would roast the garlic in the bulb. You simply cut off the pointy top to reveal the top of the cloves, pour a little oil over top and roast in the oven. Then when it’s done, you can squeeze out the roasted garlic to add to dishes, discarding the rest of it. Can this be made without flour? I am having company and two people are gluten free. Hi Dixie and yes you can. The flour is used as a sauce thickener. 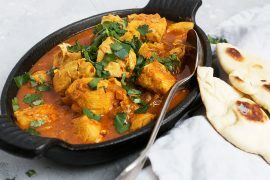 Instead of adding the flour with the garlic, just omit then and thicken the sauce at the end with a slurry of cornstarch or arrowroot starch and water. Also, you might want to make sure that your chicken broth is gluten free. Many of them contain gluten, so be sure to use one that’s clearly labeled gluten free. Enjoy! Hi Cara, I’m a fan of my crock pot too, but that said, I don’t think this one is well suited to it. It would basically disintegrate (the chicken, that is) and become more of a stew. Also, roasting is important for all that garlic, to mellow it. 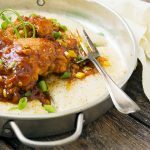 This is probably my favorite chicken dish for a relaxed week night. The gravy that the dish yields is incredibly versatile and my family loves pouring it over mashed potatoes. Thank you so much for this amazing recipe!! Thank you for sharing! With a family of 5 I’m always looking for new and delicious meals! Ive made this before (and left a comment) but I just had to reiterate how amazing this dish is! My girls saw the cloves of garlic sitting out and immediately knew what was for dinner! They were so excited to have “20 garlic chicken”, as it’s been dubbed in our house, again tonight! The icing on the cake was that I got to use two heads of garlic that I grew in my garden last year! Made the dish extra special! Thanks again! So glad to hear :) And love that you were able to use homegrown garlic Elizabeth! Hi Jennifer! I pinned this because I thought it looked delicious, and am planning on making it this weekend. When I read your bio and saw you cook from your Muskoka kitchen, I absolutely flipped! What part of Muskoka? My family has vacationed there since the 1920s, so it holds a special place in my heart. Where we’re from its very rare that anyone has heard of Muskoka, so you can imagine my excitement over your blog ? Made this tonight. WOW!! It was so good. I thought I didn’t have any wine so I used lemon juice and water and it had a nice lemon tang to it. I also had to leave the chicken in about 10 minutes longer. We served the gravy over mashed potatoes and roasted brussel sprouts. Thanks for delicious and EASY recipe. So glad you enjoyed it Laurie! This recipe is a hit with my family. I’ve made it for my hubby who is a meat and potatoes man so I had to accompany it with mash potatoes and a veggie. I also made this meal for my sister and brother in law. My sis now has the recipe. I also prepared it for my daughter and her best friend for a girls night out. As you can see, this is one of my favorite meals to make, so easy and delicious!! Hi Jennifer. A gorgeous recipe which really came into it’s own within the last 10 minutes (the butter sealed the deal for me). I agree that grilling (broiling) really finished the chicken perfectly but it also thickened the sauce a little too much so next time I do it (and this is a definite!) I’ll leave it a little runny before returning to the grill. Thanks ever so much for sharing this with us. I saw this on Pinterest and it looks SO GOOD! I want to make it but I have a dilemma. I don’t have a Dutch oven and I don’t know if any of my pans are oven safe. Can you tell whether they are oven safe or not? I could go get an oven safe pan or Dutch oven but I’d rather use stuff I already have. Dutch ovens are a bit expensive and I don’t know if I’ll use it a lot. I also did some research and I read that instead of using the oven you can use a crock pot instead. Do you think it will work? I don’t mind washing dishes I usually wash as I go. Let me know what you think. Hi Katie, First, I don’t think this recipe is suited to a crock pot, as you will basically stew it all. My best advice is to invest in a Dutch oven. Really. You will use it tons and tons :) Failing, that, transfer the chicken to any oven-proof dish for the oven trip, then transfer it back to the skillet after. Enjoy! I came across this recipe yesterday and I thought I would give it a try for tonight’s dinner. Lovely! Very very tasty! Being East European, I served it with Polenta and it works really well! Thank you, I’ll try more recipes in here. The wine cooks out, right. I am thinking of making this for about 12 people (3 of which are kids under 5). Can the wine be left out, and just add more broth. Would it change the taste. Hi Janet. Yes, the wine cooks out. Be sure to let it boil until the alcohol smell disappears. If you like, you can reduce the amount of wine and replace with an equal amount of chicken broth, but I think some wine provides a nice note in this dish. Could you use chicken breasts instead of thighs? Hi Madeline. Yes you can. I would use bone-in/skin-on and cook a little longer. I absolutely love this recipe. I’ve been making it every Sunday for a few weeks now, and my family loves it. I skipped the wine and added more broth. I also added shallots and a tiny bit of dried basil. Thanks for sharing your awesome recipe. I usually don’t post comments, but this dish is totally worth it. Oh good gracious. I made this last night and it is seriously one of the TASTIEST dang meals I’ve had! Pinned it big time and have already given the recipe to friends. Thank you! Can you substitute the wine with more chicken broth? You can, Mary. I would add a bit of lemon juice or white wine vinegar, for acidity. hi, after you cook the chicken and you’re ready to add the garlic do you leave the oil in the pot or pour it out? Hi Jos, You should leave it in. Was awesome! My family loved it! Hi Nazira, I would just replace with chicken broth and maybe add a tsp. or two of lemon juice or white whine vinegar for some acidity. I made it without the wine and everyone enjoyed it. I just replaced the wine with extra chicken broth. hello! Great looking dish and I can’t wait to try it this week. I do have a question. I recently discovered roasting a whole bulb of garlic in the oven. It turns into mush and you squeeze it out of the skin when done. It turns into a sweet flavor. Do you think this would be the same taste as garlic roasted on the stove top? Maybe do one bulb in the oven and one on the stove top? I needed the oven for something else so decided to make this on the stovetop – minus the wine since my boyfriend can’t have it. I browned chicken drumsticks, removed them, sauted the garlic and added the flour. Then I added the chicken stock and seasonings and reduced it some. I added the chicken back in and simmered it for 40 minutes, covered. Right before serving I added the butter. Next time I think I’d leave the flour out and add a cornstarch slurry at the end to make the sauce a little thicker. Just my personal preferance. The chicken was falling off the bone and the garlic was mild and very soft. We really enjoyed it. Making this tonight, on my way out the door to buy garlic and potatoes! Do you have any suggestions as to which type of onion I could add to this? Both boyfriend and myself also love onions. Or do you think it would ruin the taste of the gravy? Hi Stephanie, I noticed sweet onions in my grocery this week. That might be might choice. Otherwise, just a cooking onion. Enjoy! I’m needing to prepare this for a larger group. My iron skillet won’t hold that much chicken at one time. How do you think it will turn out if I do it all in the electric skillet? Hi Kelli, So assuming your electric skillet has a lid, I suppose you could replace the oven trip with covering the skillet and simmering. I guess, just be sure your chicken is cooked through before you remove the lid and finish off the sauce. Yes the electric skillet does have a lid. I can also set it to a certain temperature like an oven. I was hoping I could prepare it all in the same pan as in the recipe. I would just put the lid on the electric skillet at the appropriate temperature as the oven. What’s your thoughts? Should work. It may take a bit longer to simmer with the lid on vs. oven. The reason for the oven is simply to cook the thighs through, so without doing the oven thing, you’ll just want to simmer with the lid on until the thighs cook through that way. Be sure to test with thermometer or cut into them near the bone to check. Thanks for the suggestions. I will be making it tonight and will let you know the results. 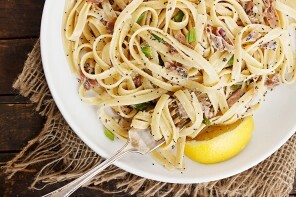 Hi there, I am going to try this recipe tonight! I will let you know how it goes. Hi Jennifer, made your rustic chicken and garlic gravy last nite. I really enjoyed it. It had a unique flavor to me, that i can’t really describe, but it was good and not over powered by the garlic (was good on the mashed taters too :)–) Would have liked if more of the garlic flavor came through. I’m wondering if why i got a unique flavor to it, was because i used Chardonnay, and i used vegetable stock, instead of chicken, was just what i had around. 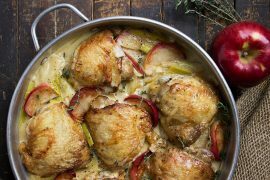 Would you suggest using a different white wine, like a pinot, or blanc, and stick with the chicken stock ? Thanks so much for another awesome recipe! So glad you enjoyed it Ruosi! I NEVER comment on blogs but I had to tell you how FANTASTIC this recipe is. Thank you for sharing! my husband and I gobbled it up! Oh my sweet garlic goodness … this is my favorite meal I’ve tried in the first 54 days of 2015! Thank you for sharing this rustic, flavorful recipe. 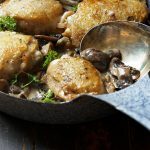 My trusted cast iron skillet was the choice for this recipe and I didn’t hesitate with 25 cloves of garlic ~ their flavor close was a caramel like richness and combined with the sauce over Yukon Gold Mashed Potatoes took the entire meal over the mark! I do believe chicken thighs with trimmed skin work best to keep the moisture in the meal. Because I live at 7800 feet in Colorado, I adjusted my cooking times based on altitude.Next time I may try a very light dusting of flour on the chicken before browning. Kudos and thanks! This looks really good but my boyfriend is allergic to sulfites and can’t have wine. Do you think the dish would work without it? Hi Sandy, Sure. Just omit the wine and increase the amount of chicken stock a bit. Wow, this was delicious!! I am doing the Whole 30, so I changed flour to arrowroot flour and wine to additional chicken stock, I also might have added more garlic, can’t ever have enough of that. So glad I made a bunch, can’t wait for lunch tomorrow. A friend made this recipe with meatballs, said that was amazing too. Yes, I browned them first! I feared the meat would become too dry if I leave it for a longer time in the oven than 20 min, but at the end an hour of stewing didn’t give it a chance to be tender anyway )) I guess you are right, I’ll try oven next time, maybe the meat will lose less juice than stewed. And I’ll surely chose thighs, something’s definitely wrong with the legs for this kind of dish, maybe they are too big… or the chicken was stiff from the very beginning… anyway thanks for answering and the advice!! :) I must say what definitely came out right was the sauce, it’s gorgeous. It was kinda revelation for me that so much garlic can produce a mild and tasty sauce. Thanks for the recipe. I was just wondering about the garlic. Do the cloves just go in the pan whole? or did you crush them before roasting them? Also 20-22 cloves seems like a lot ! Is the garlic flavour over powering in the dish? Hi Liz, The garlic should just go in whole. As they are cooked over higher heat, if they are cut or crushed, they will likely scorch. And yes, I know it seems like a lot of garlic, but the garlic essentially roasts here, so if you’ve ever eaten roasted garlic, you know that it is a much milder (sweet, almost) version of raw garlic. The finished dish will not be over-powered by the garlic. I really want to try your recipe. I have only grilled chicken thighs, never baked them. I guess I was wondering about the baking time. Seems like 15min isn’t much time. I imagine the browning process on the stove has aided in the cook time? Hi Arlene, Yes, the browning on the stove-top partially cooks them. That said, if you want to be sure they’re cooked through, you can’t hurt them leaving them 20-25 minutes in the oven. I made this, it was delicious! Thanks for the recipe! I made this for dinner lastnight. I used chicken breasts because that’s what I had on hand. Thank you so much for sharing this recipe! It was awesome. Everyone, even my picky eater asked to have it again. I had to make a last minute meal (MIL was coming over) so I had to use boneless chicken breasts (all I had). I didn’t have much left in the pan after browning the chicken, so I added the flour and half the white wine. I was a little worried I would ruin it, but it came out amazing! Thank you for saving the day!